There are 5 Treasure Chests: Wooden, Bronze, Iron, Silver and Golden. Once you meet the requirements, you can open the chests to gain nice rewards. 1. According to your total credit in a day, you can obtain treasure chests and will randomly get 3 items from a chest. 2. When you enter the event page, you can open the chests on this day. If you have gained the chests before this day, you can click "Claim" button on the calendar and then open the chests. 2. Each chest can be opened once in a day. 1. If you enter the event page on 04/15, you can open the chests on 04/15 directly. 2. If you have chests on 04/10, you can click the "Claim" button on 04/10 and then open the chests. 3. 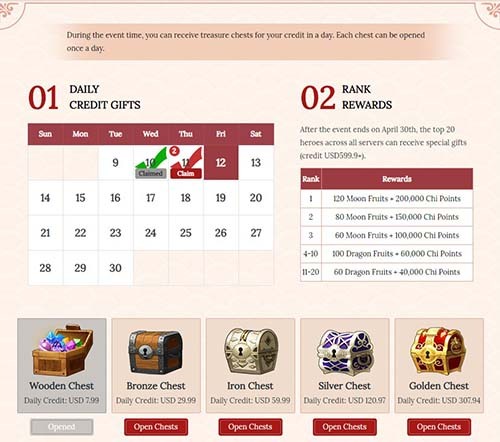 If you credit more than USD307.94 on 04/10, you can have 5 chests (Wooden, Bronze, Iron, Silver and Golden). Each chest can be opened once. You can open a chest to gain 3 items randomly. After the event ends on 04/30, the top 20 heroes (credit at least USD599.9) can be rewarded with Moon/Dragon Fruits and Chi Points. The prizes will be sent to your mailbox within 7 working days.